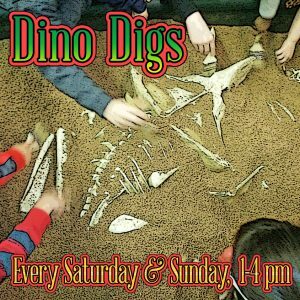 The Museum offers hands-on learning and fun at Dino Digs every Saturday and Sunday from 1-4pm. Come and get your hands dirty! Dino Digs are for children ages three and up. Donning safety goggles and using paleontologist tools, children become amateur paleontologists and dig for dinosaurs at our simulated excavation sites. Experience the excitement of excavating a dinosaur fossil. Free!